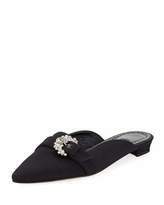 Manolo Blahnik satin mule with crystal-embellished buckle. 0.3" covered block heel. Almond toe. Buckle at notched vamp. Slide style. Leather lining. "Rubystra" is made in Italy.